Welcome to my internet home! 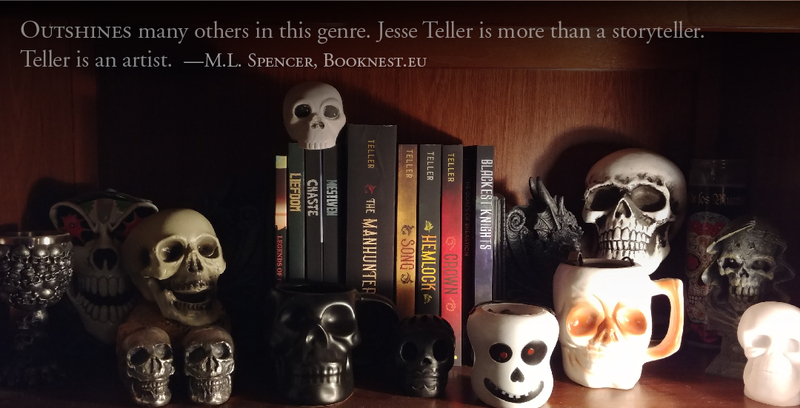 I’m dark fantasy author Jesse Teller. For more about my world, check out the Books and Maps sections of this site. I have a couple of other ongoing projects here, too. Teardrop Road includes stories from my life, formative experiences that made me the writer I am. I also interview authors in The Friday 13 feature. For more features and special offers, sign up for my monthly newsletter. Legends of the Exiles is available on Amazon. Breastion Flurryfist loved goats. As chief of his mighty tribe, he decreed no one harm a single hair on these precious creatures. When he died, his wife slaughtered and fed his goats to the tribe at his funeral feast. The men began a song that lives in infamy on the mountains of Neather. So grab a mug and toast to the fallen Flurryfist chief, with the ballad of the Goats of Breastion! The Goats of Breastion is available on Amazon. Here is the chronological order of every story released so far. I’ll update it with every publication.